Just because you have a small backyard doesn’t mean you can’t enjoy a swimming pool of your own. These small swimming pool ideas feature a variety of designs for those with limited space. There are usually two large factors which usually discourages people to have their own pool, and that is space and cost. Most people consider pools a luxury only those with bigger spaces can afford, but there are many ways to incorporate a pool area even if you only have limited space. Modern engineering and materials have made it easier, and there are many options you can look at, depending on the size of your space and your budget. Below we’ll explore the best small swimming pools and help you find an idea that may work for your backyard layout. The house in the picture above has an raised deck area with an inground pool that takes advantage of the raised elevation, placing it in an area with good views. The infinity pool is surrounded with wood decking that matches the color of the wall cladding. Views are also unrestricted as it uses clear tempered glass railings, letting your enjoy your surroundings while cooling off. Any pool under 10×20 square feet in size are generally considered to be on the smaller side. The most costly type are in-ground pools. It requires you to have some space which needs to be excavated in order to fit in a pool area. Depending on the depth and size of the pool, the price can vary, but it usually comes out to at least $50 per square foot. The average price of a small inground pool (10×20) can range from $10,000 and up depending on soil conditions, depth and water features. Other additional features will also determine the price of the pools such as the materials, finishes, special features (jacuzzi, lights, fountains, etc). It is best to determine your total budget first, and then manage your expectations from there. Many small pool designs have a deep end of less than 6 feet. The soil around your home will have a large impact on cost as well. If the builders hit rock it will drastically increase the price. 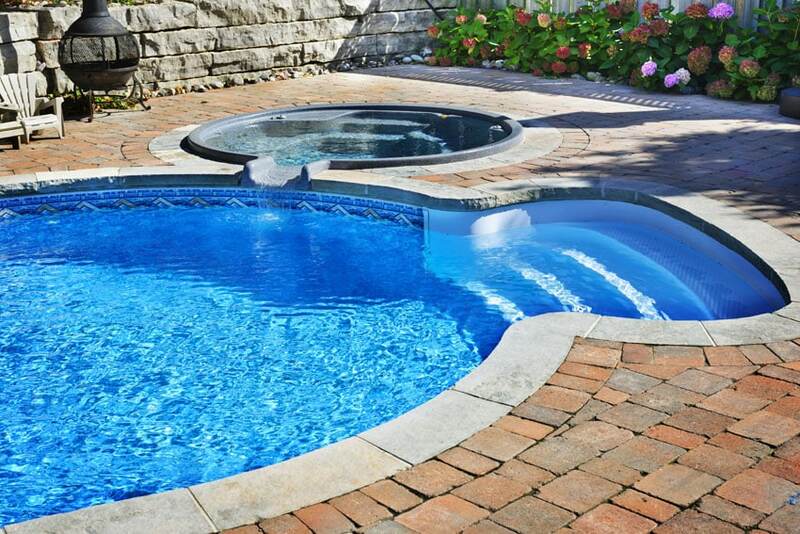 If you feel like excavation takes too much time and costs too much, then considering a raised pool area would be a great idea, as it also costs less than inground pools. They are easier to install and some has the added benefit of being easily disassembled/portable, so you can easily remove the pool area during the colder seasons. For those with a sloped yard it may be advisable to think about a semi inground pool to integrate with your outdoor landscaping. Fiberglass models can be considerably cheaper and can be hoisted in to hard to reach areas using a crane. Another option you can explore if you have both space and budget constraints, are plunge pools. These are very small pools, where you can dip/plunge in. It doesn’t have that much space for adults to swim in, but serves more as a water feature in which you can submerge yourself in and relax. Depending on location, you can install an inground or an above-ground plunge pool, or even integrate it into the design of the garden, somehow making it double as a garden water feature. This small pool area is accessible directly from the bedrooms and visible from the terraces, making it a great common area for lounging and relaxing. Small swimming pool ideas should always complement the home’s design. This backyard features modern architecture, while the small pool area also has straight and sharp edges, lines with blue mosaic tiles to make its water color stand out from the earthen hues of the structure. As for design options, there are many designs and styles to choose from, but the best option would be to choose a design which matches or integrates well with the existing design of your house/structure. Infinity pools and wood decks look great with modern minimalist homes, while a more classic form with stone or terracotta tiles surrounding the pool area would better match Mediterranean style homes. Don’t be afraid to experiment with shapes, curves and different additional features to make you pool design more interesting. Below are some excellent examples of small pool designs. 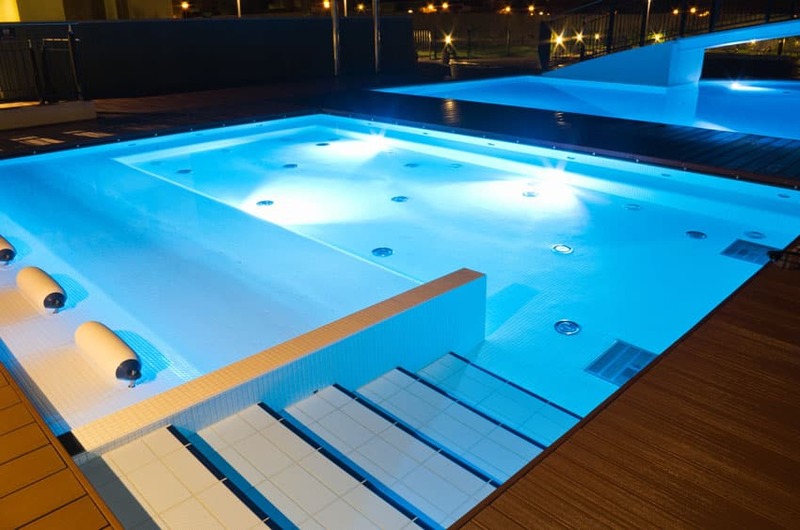 There are a variety of inground, above ground and plunge pool designs to give you some inspiration for your own home. This small pool area has rounded corners for a softer look that in contrast to the straight edges of the architectural design. This gives the pool a more dynamic feel to it despite its small size. Whenever summer arrives, and the weather becomes hot and humid, everybody somehow wishes to have a pool right in their backyard, somewhere to dip in and cool-off the summer heat. This swimming pool fits in a small courtyard backyard with ease. Bright turquoise blue tiles helps make this small pool area really stand-out against the dark gray tiles around the area. The bright choice of tile color helps pull your attention towards it, therefore making it the focal point of the backyard. Mediterranean architecture is full of flowing, organic forms and arches, and therefore, this pool was made to complement such architecture. Placed in the middle of brick pavements, this irregularly-shaped pool mimics the L-shaped plan of the structure, framing it with terracotta-toned stone tiles and using a deep green color of the tiles inside the pool to make it stand-out against terracotta hues. Infinity pools doesn’t have to be big, in this case, you will see an excellent example of a small square-shaped infinity pool which was strategically located to have a gorgeous view of the horizon. 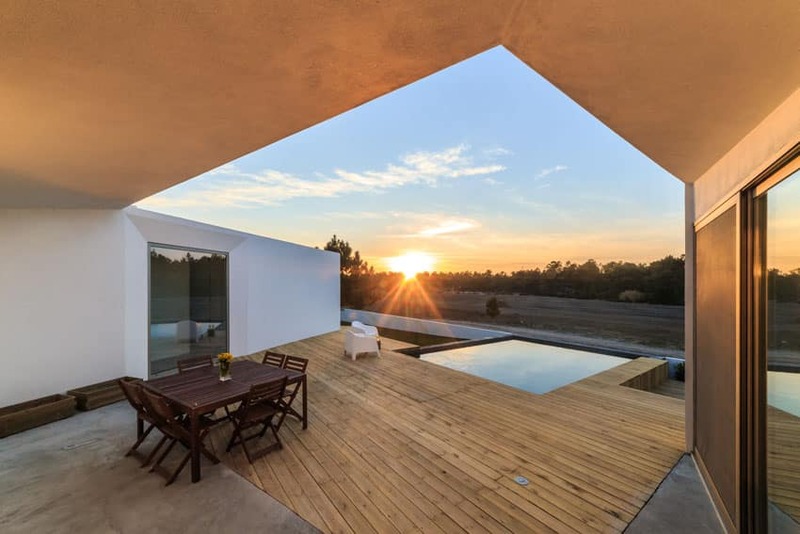 This small pool area complements the modern minimalist architecture of the house, and is just the perfect size for the meager backyard space. 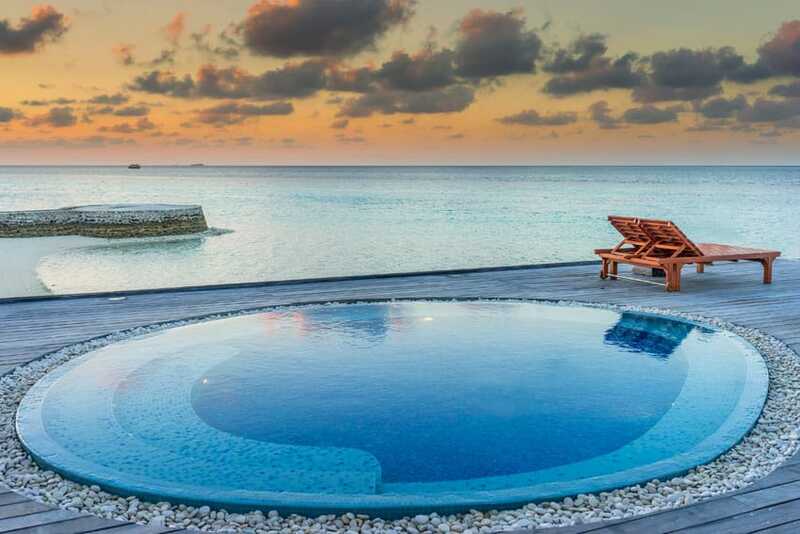 Placed right by the ocean, this small pool area is more of a jacuzzi-type pool meant for relaxation and to enjoy the fresh sea breeze and the view. It was placed on a raised deck just by the sea, and has an irregular round shape, to give it a more natural/organic feel. Surrounding the pool is the drain, covered with river stones to conceal it. This irregularly-shaped pool is made up of multiple overlapped circles, creating a fun and dynamic pool shape. The cloud-like pool area definitely stands-out against the pebble concrete flooring of the backyard. 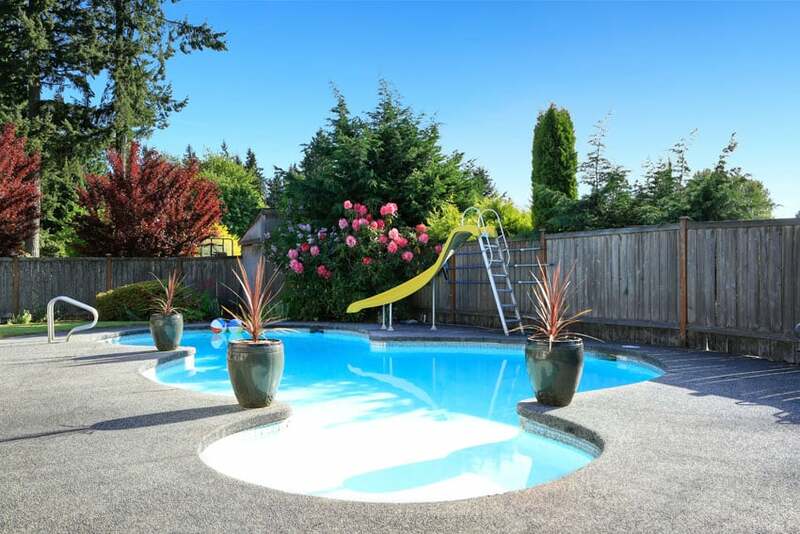 With the addition of plants and a bright yellow slide, this pool area adds a fun and youthful feel to the otherwise sombre colors of the area. 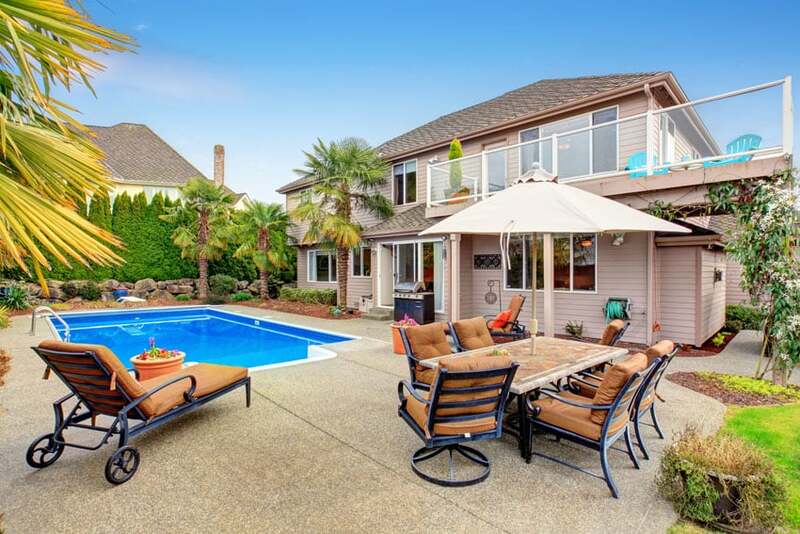 Placed right in the middle of the backyard garden, this small pool area is surrounded by lush greens and shrubs, as well as a conveniently-located bar area, lounge area and even a swing love seat. The small 10-gon (Decagon) shaped pool area serves as the focal point of the area, being the only bright blue in the middle of greens and yellows. A very small round pool area like this can be used a jacuzzi for a relaxing warm dip, or it can even appear or function as a small fountain water feature in your garden. PVC wood decking was used to surround and frame the pool area, giving it a natural and modern look. 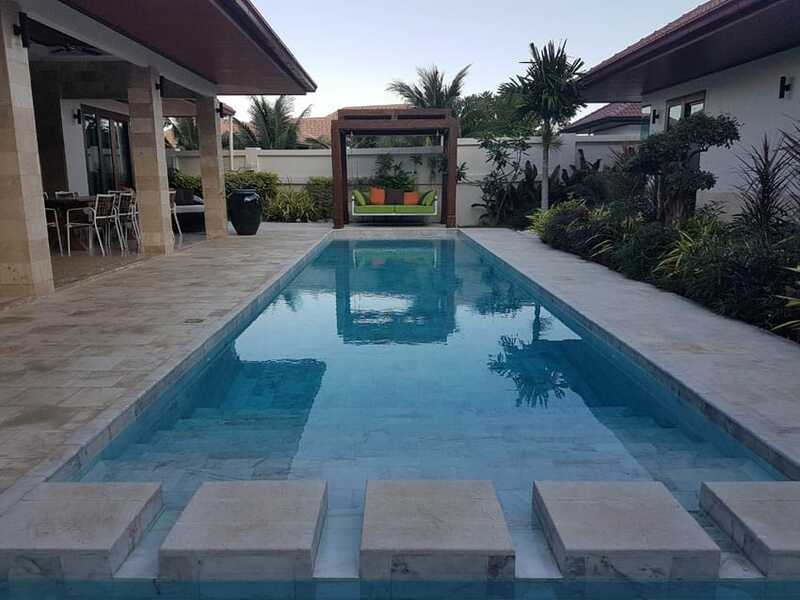 Despite its limited size, the pool allots an area for swimming, and another size for lounging, wherein the pool floor has a higher elevation and slowly slopes towards the main pool area. Lights were installed in the pool as well for better night visibility, and built-in benches were also built in the perimeter of the pool. 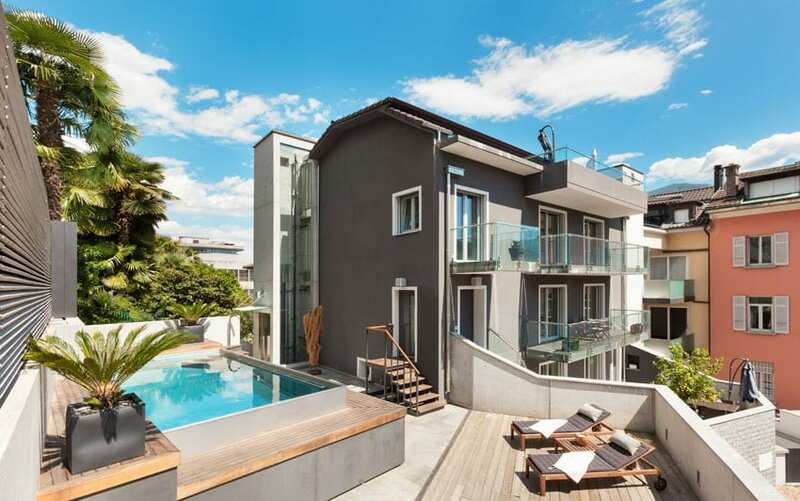 Even on small rooftops, installing a small pool area is possible. In this example, a platform was built to accommodate the depth of the pool, and uses wood decking for its sides. The raised pool naturally becomes the focal point of the space, and also allows the pool users to have a gorgeous uninhibited view of the surroundings. The use of wood deck tiles is a quick and efficient way to create the perfect landscape and flooring for your pool area. 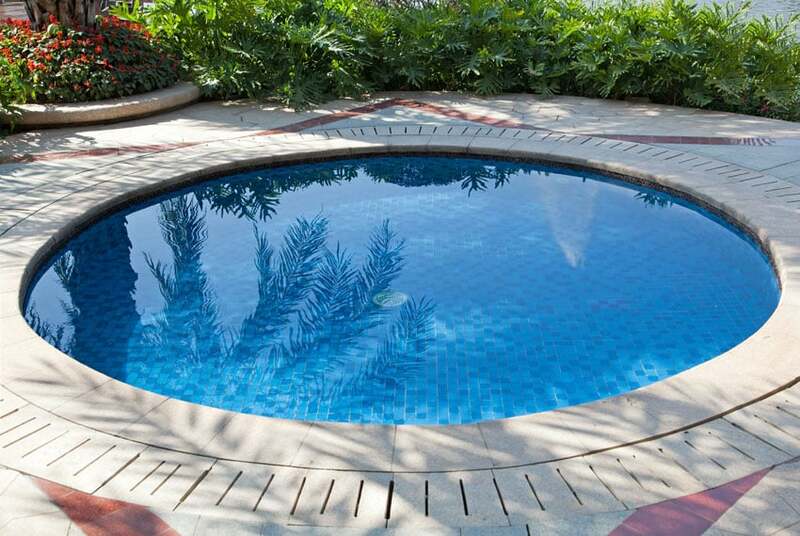 This example features a basic, small rectangular pool with blue mosaic tiles, surrounded by wood deck tiles. Since wood deck tiles are simply installed by putting it on a flat surface, this saves you a lot of time when compared to installing pavement or other flooring materials. Just always make sure that it stands on a durable base or framework, and that you use outdoor-grade decking so that it would last for years. Going for a fun and organic concept, this small pool area looks more of a water feature than an actual pool, because of the design of its surrounding landscape featuring large stones, plants, and even a small hanging bridge. This gives the pool area a more fun feel to it, rather than being a basic rectangular pool. Following the minimalist aesthetics of the house, this small pool area is long and narrow, separated from the lanai only with tempered glass railings. The flooring material used on the sides surrounding the pool seamlessly extends until the wall of the inside of the pool, for a seamless, minimalist feel. For added privacy, plants and shrubs were utilized to serve as a natural barrier on the side of the pool. A small in-ground pool design which was fixed to a large open lawn area, making it easy to convert into a pool area. 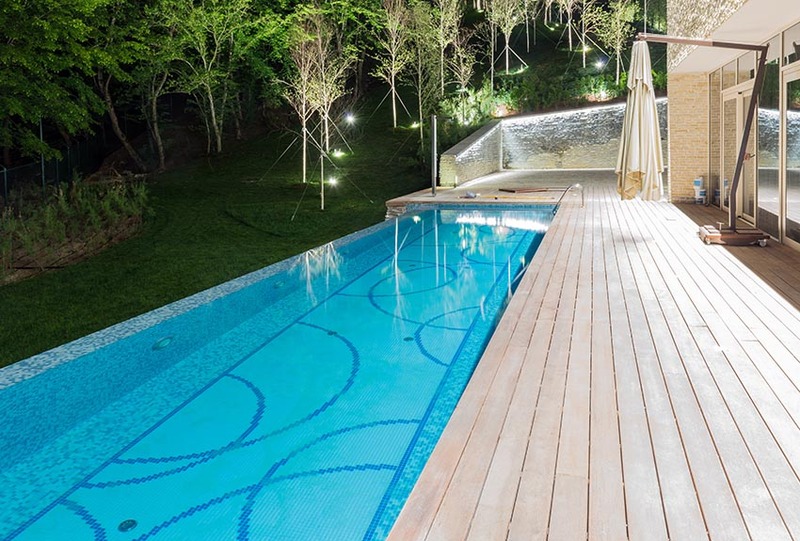 The pool has an irregular curvy shape, and is surrounded by wood decking for a more tropical feel to the pool. Despite the small size, a small corner of the pool was allotted for a jacuzzi area, its round shape perfectly matching the curvy design of the pool. 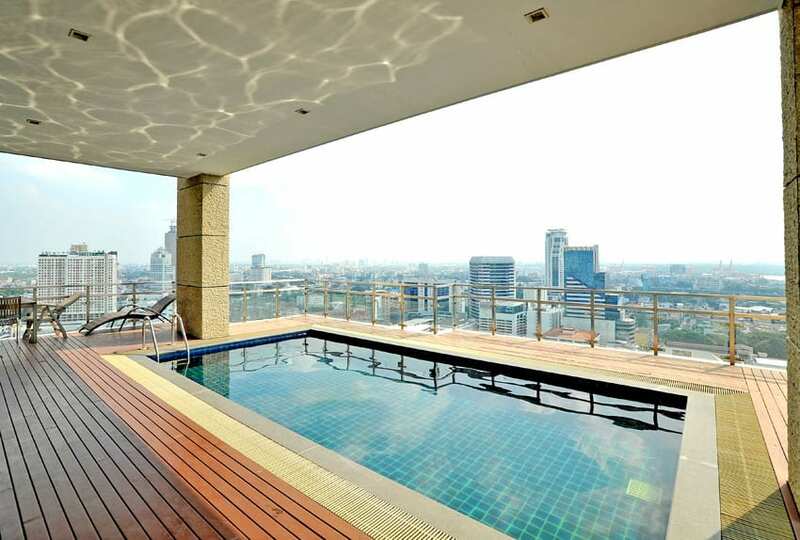 Placed in a sizeable balcony of a high-rise building, this small pool area is afforded with a gorgeous city view. The small rectangular pool is framed with a metal gutter and surrounded b PVC wood decking for a non-slippery surface. Only half of the pool is covered with the canopy, and the railings are made of stainless steel and clear glass, giving you an unobstructed view, even while inside the pool. The use of of terracotta and cobblestone blend to frame and surround this tiny pool area is reminiscent of Old English parks and walkways, giving it a very classic feel. The deep blue and white combination of the tiles and patterns used on the inside of the pool also enhances its classic European feel, giving it a very classic appeal despite the use of modern materials. 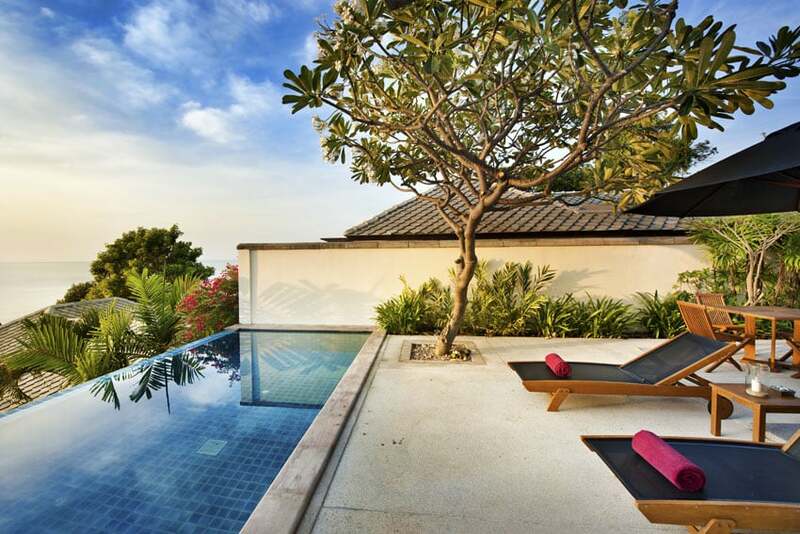 This small villa definitely took advantage of its excellent vantage point from the sea, and installed a small in-ground infinity pool overlooking the beach area. It’s minimalist design is the perfect choice as space is quite limited. The use of landscaping also enhances the overall ambiance of the pool area. This small, narrow inground pool area lies right in the middle of parts of the house, giving rooms a wonderful view of the pool & garden combo. For modern and seamless look, marble stone tiles were used in and around the pool area. 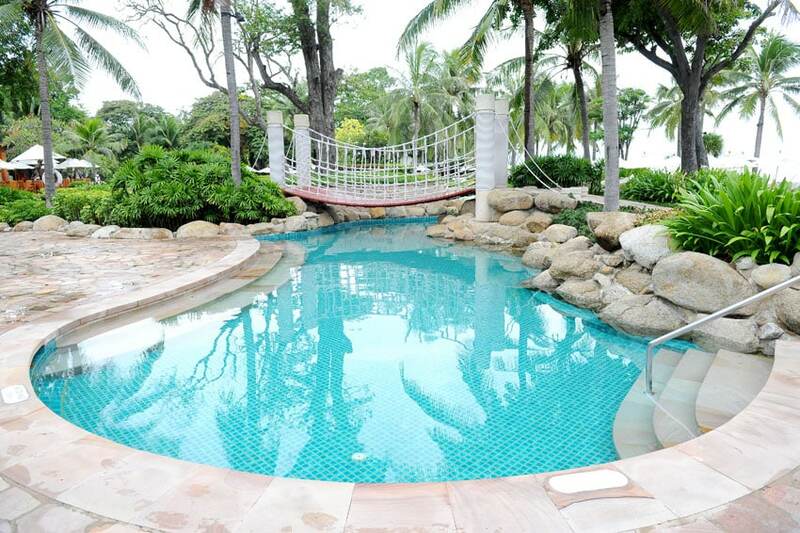 To make the narrow pool even more interesting, it adds a stepping stone feature across the two sides of the pool, allowing you to use it as a bridge to the other side of the house. This small balcony area has a small, almost tub-sized oblong pool area, which is covered by the balcony canopy, but is also located in an area where you can enjoy the view from the balcony area. The pool is framed by stone tiles which were slightly elevated from the white flooring, in order to easily distinguish between floor levels and avoid accidents. Palm trees and landscaping helped improve and give this small pool area a more tropical look. The simple inground pool area was placed right in the side yard of the house, surrounded by concrete terrazzo flooring for a durable finish that will last for years. 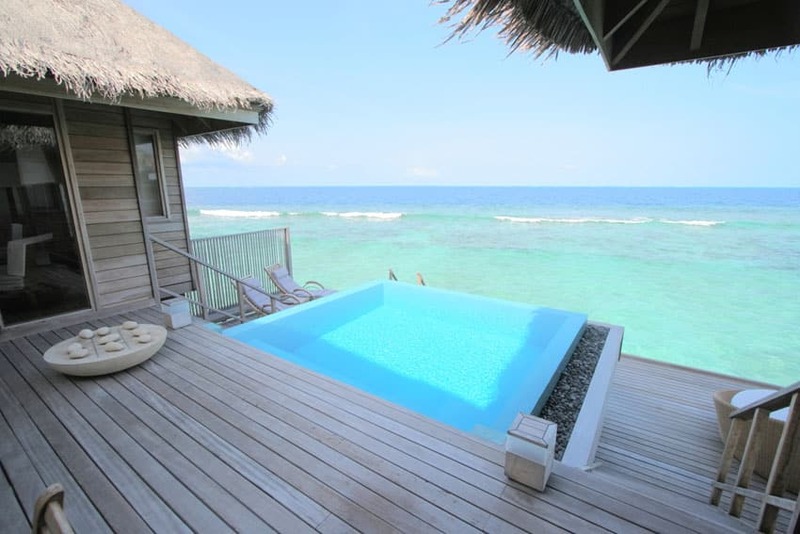 This tiny square mini infinity pool is placed on the deck of a floating cottage, giving you a full and gorgeous view of the sea from the pool rea. The small pool is raised on a deck and surrounded by small pebbles to cover the drain. 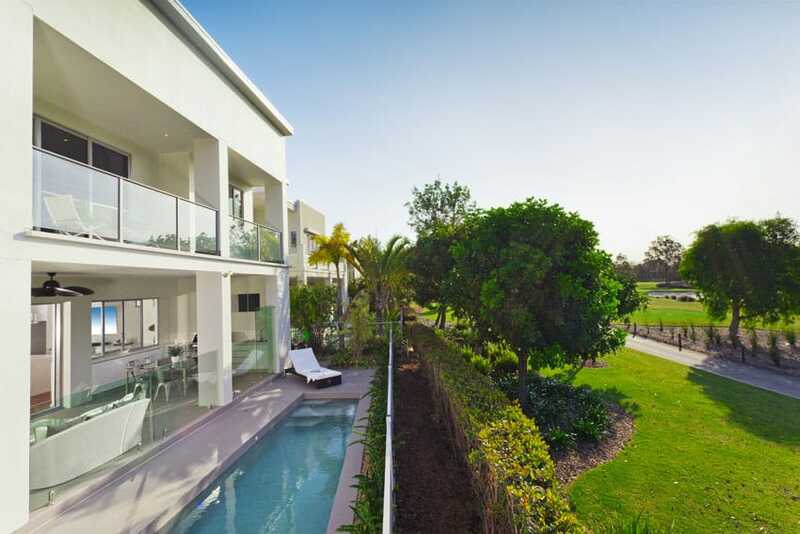 On the sides of the raised pool area are the lounge areas which also enjoys the same gorgeous natural view. 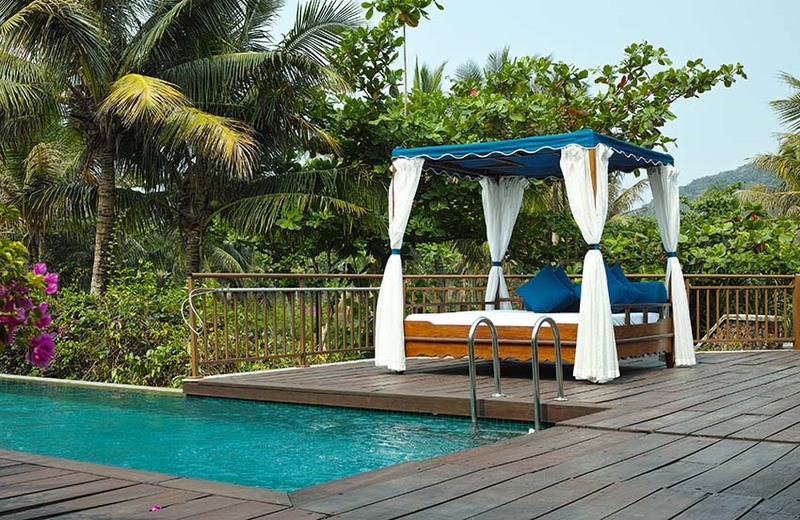 Surrounded by greens and coconut trees, this small pool area is a tropical haven perfect for relaxation. The modern infinity pool is surrounded by solid wood decking, effectively concealing the pool gutter. Despite its small size, the open space makes it feel more spacious, and all the shrubs and plants surrounding it helps give you a sense of privacy as well. 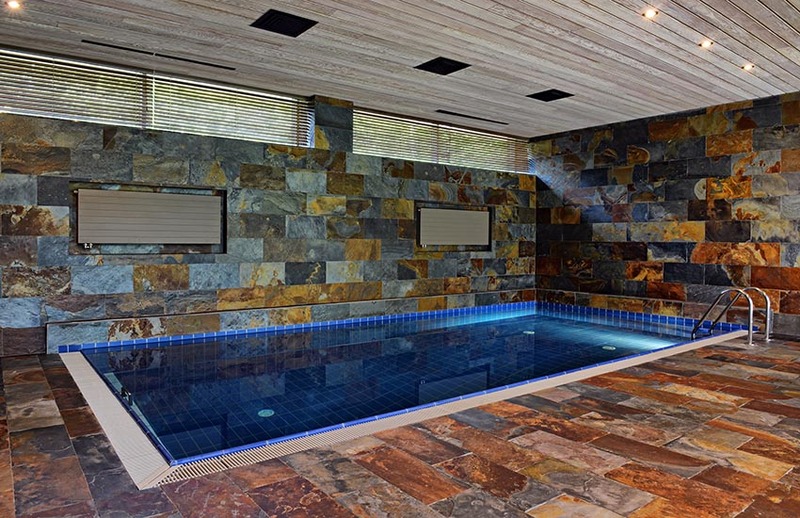 This small indoor pool did not scrimp on using luxury materials as it uses natural slate stone tiles for its floors and walls. 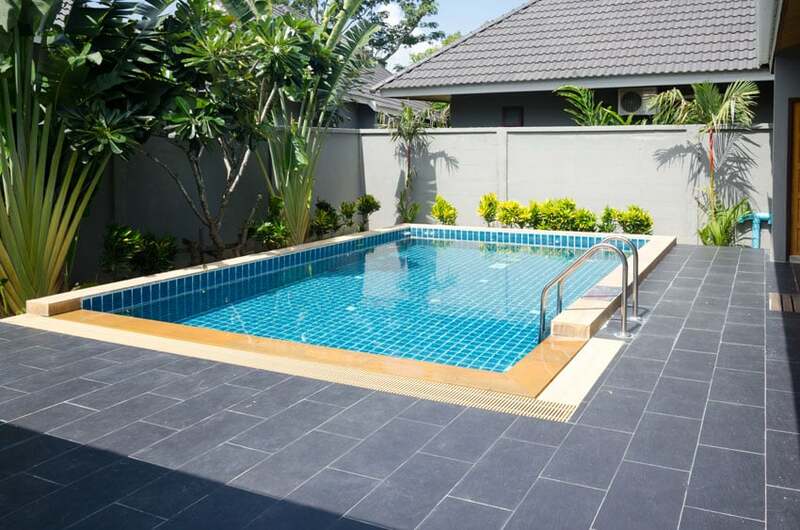 The in-ground pool area, however, keeps it simple with the use of cobalt blue tiles, making it stand out from the natural earthy colors of the floors and walls. The unique location and slope location of the house allowed a small infinity pool to be built on its side, overlooking the forest and the garden area. As the sides are free from railings and other obstruction, you feel one with nature and gives the illusion of a spacier pool. Surrounding the infinity pool are solid wood decking in a light birch color to match the finish of the house exterior. The small backyard space of the house was dedicated for the pool area. Due to the limited space, the pool was slightly raised above ground, and can be accessed with a small flight of steps. As the pool is right beside the property wall, the wall was converted into a water feature, turning it into a wall fountain clad with black slate tiles. Most infinity pools have clean, straight lines, but this infinity pool placed on a raised deck area has a curved shape instead, mimicking the natural curve of the seashore. 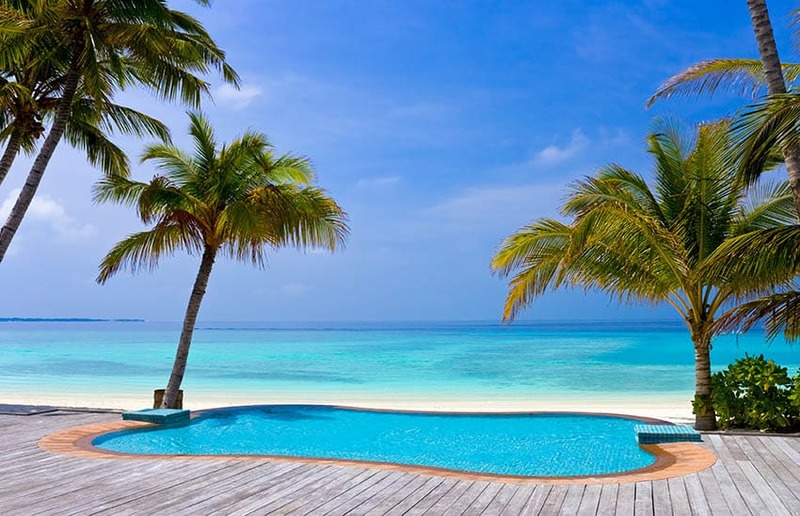 As this small pool area is right by the sea, with a clear, unobstructed view, you somehow feel that you are in the ocean instead of the pool. 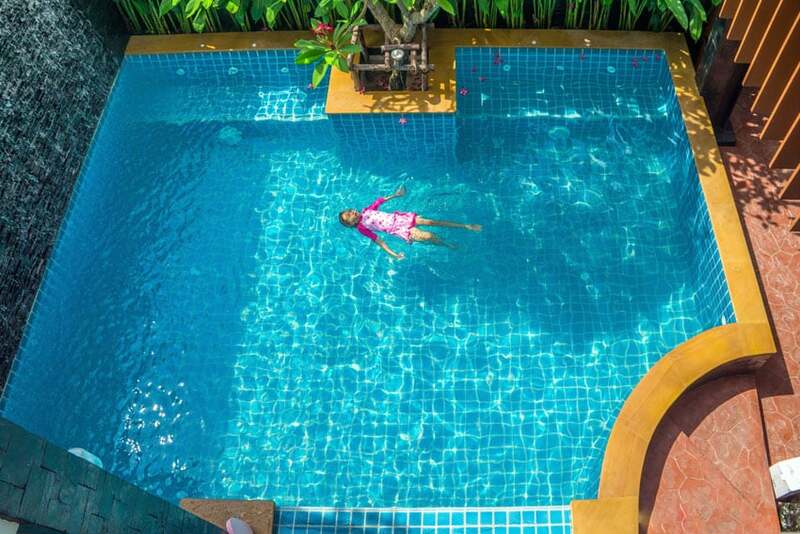 See more kidney shaped swimming pools on this gallery page. This is a great example of an Asian-inspired pool design, which makes the pool a double-purpose feature: it functions both as a normal, functional pool, but it also functions as a garden water feature as well. 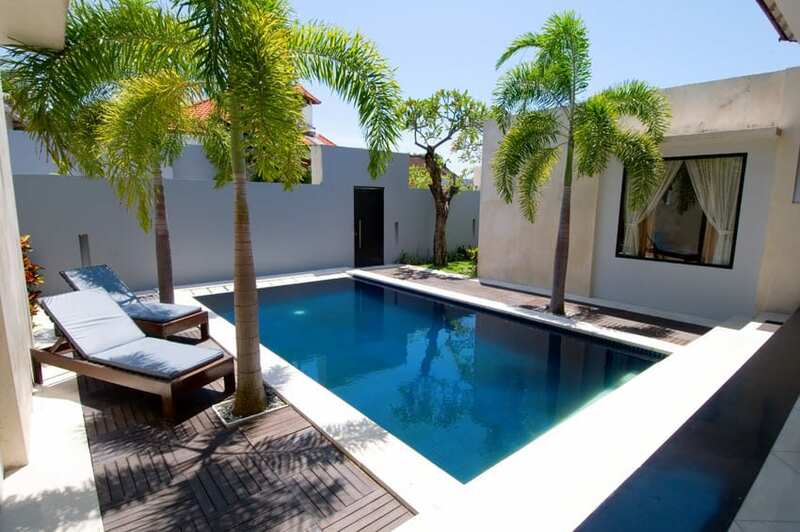 The choice of materials makes the pool area blend with the garden, making it an integral part of the landscape design.